ANOKA, Minnesota - July 29, 2015 - In 2013, Federal Premium® made law enforcement’s top duty round available to the public, creating the ultimate Personal Defense® load: HST®. 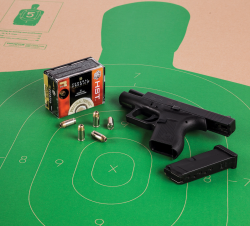 This year, the product line is even stronger thanks to a new load in 380 Auto, which is an excellent option for concealed carry pistols. Shipments of this new ammunition are currently being delivered. HST ammunition provides consistent expansion, optimum penetration and terminal performance that raise the bar for micro-size handguns. Its specially designed hollow point won't plug, and the jacket and core hold together to provide almost 100 percent weight retention. The construction ensures micro-size handguns deliver the power needed for personal defense situations. HST 99-grain bullet’s exclusive design delivers best-in-caliber expansion, outperforming all other leading factory brands in 380 Auto. The result is full-size terminal performance from a compact platform. Performance tests were based on bullet and crush cavity diameters versus competition; tested with a micro handgun in 380 Auto with a 2.75-inch barrel fired into 10 percent ballistics gelatin at 10 feet.